Popstar Madonna is known as a woman who does not mince her words. She has used her forthright manner to try to stop online piracy of her latest album, American Life. File-sharing networks have been flooded with fake tracks, which contain no music but instead have Madonna saying; "What the f*** do you think you are doing?" But despite efforts to stop unauthorised copies appearing on the net before its release, the album was readily available for download on several MP3 websites last week. The record industry blames the phenomenon on online music-sharing for a global fall in CD sales. Albums by high profile artists often pop up on the net to download, weeks or even months before their official release date. Tracks from the forthcoming Radiohead album have already appeared on the web, even though the album is not due to be in the shops until June. One of the tactics used by record labels to thwart music pirates is to swamp file-sharing networks such as Kazaa with decoys. In Madonna's case, the fake tracks are being used to send a blunt message to people trying to get hold of her music for free. The fakes appear to be full-length songs, so anyone downloading them does not know they have been tricked until they play the files. The gibe is part of a campaign by Madonna and Warner Brothers Records to prevent tracks from her American Life from being copied on online file-sharing services before goes on sale this week. It comes in part due to the problems that plagued her last album, Music, when unfinished snippets of the title track showed up on services like Napster before the album's official launch. The American rapper Eminem used a similar tactic last year, with tracks appearing in file-sharing networks that only contained snippets of songs looped over and over. 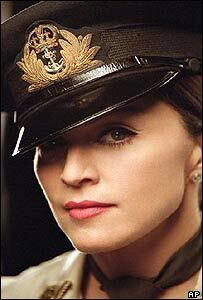 However, Madonna and her record label have only been partially successful in keeping American Life under wraps. Last week, the album turned up on several MP3-sharing websites. And over the weekend, her official site was hacked, with tracks from American Life offered for download. The attack was in response to the fake songs on the file-sharing services. 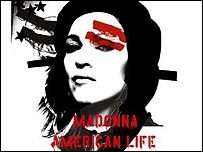 The album American Life has just been released in the UK and the US.